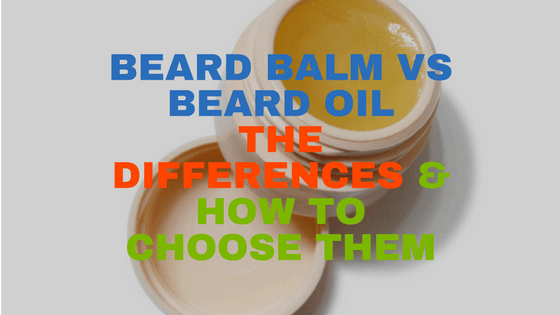 In this guide, we will clear your confusion about beard balm vs beard oil. The grooming space is huge. There are hundreds of products coming out on a regular basis. When we talk about the beard, it is even bigger than our expectations. With so many products, it is really confusing for us which one to choose. More importantly, we need to know which product work for what purpose. Beard Balm and Beard Oil is among those products. People often get confused about it. Even we were. But when we started testing and applied both oil and balm, we now have the clear idea about the real purpose behind each product. And in today’s section, we are going to cover exactly that. C) The core difference between beard balm and beard oil. Beard oil is made from different kinds of carrier oils and essential oils. things like jojoba oil, grapeseed oil are a great addon in a quality product. Beard balm also known as a moisturizer. But more actively it helps you to style your beard. The balm works more towards holding your beard for more time. you can style it as you want while retaining the benefits. It contains shea butter and beeswax. Both work to help you form and style your facial hair in a natural way. Typically, it is being used when you have a bit longer beard. I really do not know a perfect size but I like to use it when my facial hair reaches at one and a half inch long. If you are having a shorter beard, we recommend of using an oil instead of balm. Because you do not have anything to hold in your face. Moreover, the shorter beard does not need any style. It is the way it is. Stay away from balms which contain synthetic ingredients like petroleum jelly. There are possibilities of damaging or losing hair. Many people love to grow a short beard. Are you one of them? If yes, we recommend that you go with good beard oil. At this point, your beard is not long enough to give it a style or thickness. So there is no usage of the balm. Also, a shorter beard is more manageable than a long one. Let’s face the truth. A longer beard needs more attention than any other part of a grooming section. You need to maintain it properly day and night. It becomes essential that you use a balm at this point to make it more manageable. If you apply it regularly, it becomes much more controllable. Once you wash your face, pick some balm and rub between your palms. Now, run it via your finger. You can start from the neck and work all the way up. Just make sure the balm actually touches your beard area. Also, do not forget to spread your finger on your mustache and little hair around your mouth. There is no difference here. Just use the like the balm process above. One extra thing you can do is – once you apply the oil, you can use a brush to make it more shiny and manageable. When is the right time to apply beard balm & Oil? As you know beard balm shape your beard, it’s best to use it in the morning. After we wake up, everything including our head hair is messed up. So to fix it, apply the balm and you are all set for the day. You know when to apply the balm. What about the oil?. We recommend right after taking the shower. It's time for some FAQ. Question 1: How much I have to use balm or oil? Answer: there is no specific answer. First, you have to try and test at least for some days to know that exact answer. It also depends on how long and deep your facial hair is. Question 2: What If I want to use both beard balm & beard oil? Answer: Sure. There is no hard and fast rule for it. If you want to test both the product, you can do so easily. Just a friendly reminder that you use it in a moderate way. Both products have their similarities and differentiate. Question 3: Is there any guide to choosing a balm or guide? Answer: we are going to launch our beast guide for both tools. So stay tuned. Question 4: Does Beard balm have any fragrance? Answer: typically, they don’t smell. On the other hand, beard oils do come with some fragrance version. Question 5: I have a shorter beard. Can I use Beard Balm? Answer: If you have a shorter hair, we recommend you to use some oil and let it grow before using the balm. But, if you want to use it, there is no one stopping you. Definitely, you can give it a try. Question 6: Is there any fixed amount? Answer: No.. but eventually, you will be able to figure out once you start applying. Question 7: Is there any side effect of using Beard balm? Answer: In short, they should not have any side effect. But we strongly encourage you to check before purchasing. Make sure you do not bring home a balm which contains synthetic ingredients like petroleum jelly. Question: What is carrier oil & essential oil? If you do not want to use both, see the above difference and make a choice. Know that, you have to pick something. Whether you want to nourish your beard by using an oil or style it by a balm. Unfortunately, we can’t decide it for you. But we can surely help. And that is what we are trying to achieve. Giving you our hand and taking down the guesswork. Do you have anything in mind? Want to ask something? What is your preference? beard oil or beard balm? When do you use beard oil and when beard balm?